Minority Whip Steve Scalise, R-La., filed a discharge petition for the Born-Alive Abortion Survivors Protection Act, H.R. 962, in an attempt to bring the bill to the floor over Democratic resistance. More than two dozen previous efforts using a different procedure have failed. Since Feb. 6, various GOP members have sought unanimous consent for consideration of such a proposal on 25 occasions, but the presiding officer from the Democratic majority has declined the request each time. Success appears highly unlikely for the discharge effort. To succeed, a discharge petition requires a House majority -- 218 signatures – to bring the bill out of committee to the floor. Republicans have 197 members in the House, and no more than three Democrats typically vote for pro-life legislation. Scalise acknowledged the difficulty in an April 2 news conference before filing the petition. "Frankly, it should be easy to get all 435 members of Congress to sign this, but it's not. In fact, it's going to be hard," he said. "We know it's an uphill battle, but we don't come here to do the easy things. We come here because it's hard and we're here to do the most difficult and toughest things, and, most importantly, to stand up for the most vulnerable among us." The petition had already received 193 signatures by early evening April 2, the bill's sponsor -- Rep. Ann Wagner, R-Mo. -- said on Twitter. That is "the most signatures a discharge petition has received in a single day in over 2 decades," she tweeted. 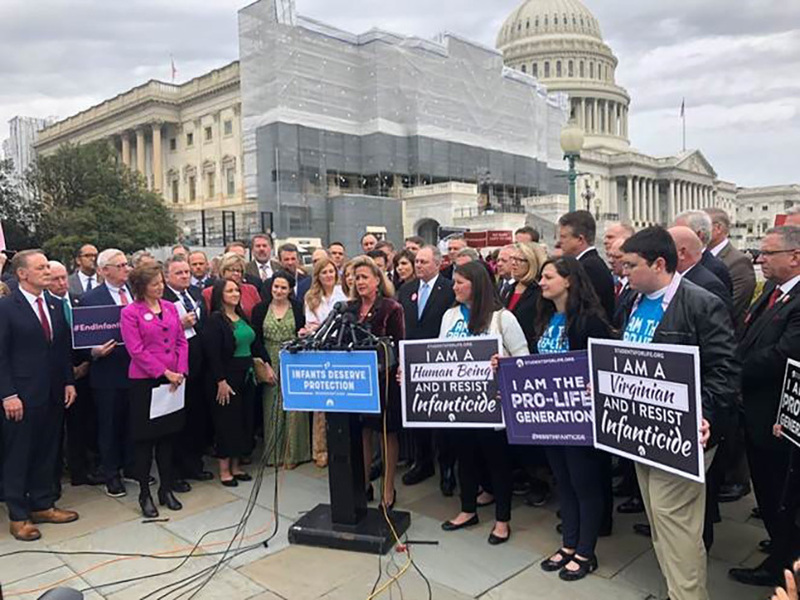 Democratic opposition to the legislation in both the House and Senate has made members of the party vulnerable to understandable charges of supporting infanticide. The bill not only says a child who survives an abortion or attempted abortion is a "legal person" deserving protection, but it mandates that a health care provider give the same degree of care offered "any other baby born alive at the same gestational age." Southern Baptist ethicist Russell Moore told Baptist Press, "The unwillingness of some elected officials to vote on whether it should be legal to leave a crying baby to die on the table is as morally reprehensible as it is politically shameful. "A child's intrinsic dignity is given by God not the circumstance of their birth," Moore, president of the Ethics & Religious Liberty Commission, said in written comments. "Americans deserve to know where their elected officials stand on infanticide, and I am thankful that nearly 200 members of Congress signed the petition to bring the Born-Alive Act to the House floor for a vote." Attempts to gain passage of a companion bill in the Senate also have failed. On Feb. 25, senators voted 53-44 to bring the measure to the floor for a vote on final passage, but the effort failed to reach the 60 votes needed to succeed in the procedural move known as invoking cloture. The vote came three weeks after a Democrat, Sen. Patty Murray of Washington, blocked an effort by Sen. Ben Sasse, R-Neb., to gain unanimous consent from the Senate for his bill. Abortion-rights advocate decried the Republican discharge attempt. Jacqueline Ayers, a vice president of Planned Parenthood Federation of America, called it "another out of touch attack on women's health and rights -- based on dangerous lies. Republican leadership is shaming women and criminalizing doctors for a practice that doesn't exist in reality." Reports of permitting children who survive abortions to die without care, however, date back at least 20 years, when nurses reported that a method known as live-birth abortion was being used in at least one hospital in Chicago. The practice resulted in surviving babies being left unattended to die. Although the legislation existed in the previous congressional session, it gained new attention this year after events in New York and Virginia. New York enacted a law in January that legalizes abortion until birth and, according to pro-life analysis, removes protections for babies who survive abortion. Shortly thereafter, Virginia Gov. Ralph Northam expressed support for allowing abortion-surviving infants to die. Northam's controversial remarks came in a Jan. 30 radio interview in which he was asked about a fellow Democrat's bill in the Virginia House of Delegates that would have legalized abortion until birth. Northam said of the proposal, "If a mother is in labor, I can tell you exactly what would happen. The infant would be delivered. The infant would be kept comfortable. The infant would be resuscitated if that's what the mother and the family desired, and then a discussion would ensue between the physicians and the mother." The Virginia-ignited uproar came a week after New York enacted a law that legalizes abortion until birth for the mother's "health" -- which is not defined and has been interpreted by the U.S. Supreme Court to include essentially any reason -- and as other states seek to wipe out limitations on the procedure. At least in part, the effort is based on the concern expressed by abortion rights advocates that two Supreme Court justices nominated by President Trump will help overturn the 1973 Roe v. Wade opinion that legalized abortion. Unlike the new bill, Democrats did not block similar legislation that gained approval in 2002. The Senate passed the Born-Alive Infants Protection Act by unanimous consent, and the House of Representatives approved it by voice vote. The measure, signed into law by President George W. Bush, clarified that a newborn child -- "at any stage of development" and fully outside the womb -- is a person to be protected under federal law. The 2002 law does not adequately protect children who survive an abortion, supporters of the new proposal contend. The new legislation makes specific requirements of health care providers and calls for penalties not in the 2002 measure. Under the new proposal, an infant who survives an abortion must be admitted to a hospital after initial treatment. A violation of the measure could result in a fine and/or a prison sentence of as many as five years.